Considering a competitive NAS OS? If you are considering a competitive NAS OS as your networked attached storage solution, take a look at the new CORE3 based NASLite server operating system lineup. Based on the latest Linux Kernel, the CORE3 performance and Hardware support improvements place the new NASLite lineup in a league of its own. 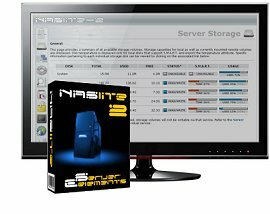 With 32-bit and 64-bit versions available, your NASLite server can support a range of computer hardware starting with a 128Mb Pentium upwards of 16Gb and 16 CPU cores. Unsurpassed stability, ease of use, low cost and highest performance in its class have made NASLite a favorite amongst Network Attaches Storage users around the globe. So, before you go with a competitive NAS OS, find out more about NASLite and other fine Server Elements solutions by browsing our Website.